The hackathon weekend kicked off with yet another pre-event called "Innovative Approaches Towards Resource Efficiency & Circular Economy". In the early morning of October 6th, a bunch of sharp, inventive and energetic specialists from 10+ countries gathered at Spring Hub - a creative space in Tallinn, where the Circular Economy 2017 hackathon is taking place. After morning coffee and refreshments, the day was opened by Ado Lõhmus from Ministry of the Environment of Estonia. The goal of this pre-event was to gather some eco-innovation initiatives that could be further developed during the weekend. Before the start of teamwork, three wonderful keynotes took place. We had Matthew Fraser talking about circular economy principles", Roman Zinchenko about "Taking action on the circular economy" and Kristjan Kookmaa about "Practical solutions for the circular economy and resource efficiency". 3.How to make products last longer. 1.An interactive app for gaining information about recycling in communities with two great goals: 1) raising awareness about correct recycling; 2) building community. 2.A PR campaign using positive role models to raise awareness about toxic elements in cosmetic products. 3. A new business model which encourages wind turbine producers to create better products and improve the systems and logic. Then offer them a chance to lease wind turbines for private persons. But this is just the start and we cannot hide our excitement when we think what is going to take place starting from Friday 18:00 when more great people will come together! 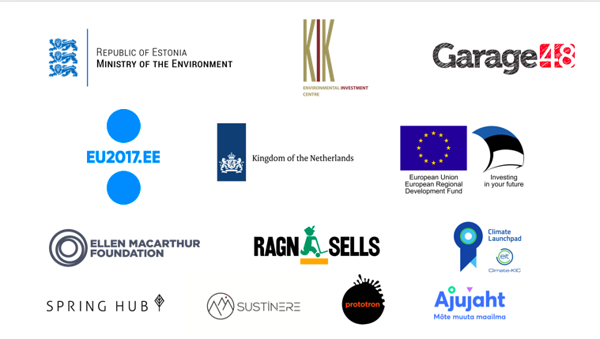 This event is organized in collaboration with Estonian Ministry of the Environment, financed by European Regional Development Fund and Estonian Environmental Investment Centre.